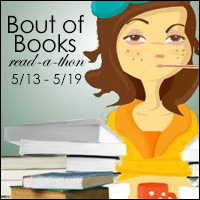 For Bout of Books 25, challenges will be hosted on the Bout of Books blog with credit/link to the site/person who provided the idea. Challenge sign up will close April 21st at 11:59pm CST. For those applying, PLEASE keep a copy of both your challenge ideas. We won't retrieve your challenge if you're chosen as a host.